Pests are a major concern for the overall health of your home. Any kind of pest may spread diseases and in severe cases may render the home unlivable. Pests are not welcome in any home. Drive them away by letting us ensure your house is free from all kinds of pests. From insects to reptiles, from rodents to larvae, there is not a single pest that our professionals can’t handle. We offer long lasting, effective and reliable pest control services in Bahrain. Our workmen will get rid of all trouble-making creatures for good. You can rely on us. Your home belongs to you. You need not share it with unwanted visitors. Our professionals can help you get rid of all kinds of pests. We offer reliable and long lasting pest control solutions that will keep all types of insects, rodents, reptiles at bay – and for good. We keep ourselves updated about the latest chemicals that kill all pests while being minimal in damage to humans. Our workers never overuse any of the chemicals used to kill the pests, keeping in view your health. After all, our customers’ happiness is everything for us. Contact us for all kinds of pest control services in Bahrain. We offer our services all over the country. For pest control, we take appointments on call or online, for a scheduled appointment or an emergency. Once we receive an invitation for pest control works, our team will visit your place. The Handyman pest control team will take a tour of your home/office and thoroughly check for all places, every nook and corner for the manifestation of moth posts, beehives, rat holes, cockroaches or any other trouble causing creature. Once our people get an idea of how much work and what work is needed to be done, we’ll prepare an estimate of the cost of work that might be incurred to get rid of all infestation. We’ll hand over the estimate to you. The estimate is a tentative statement of the total cost of pest control. We charge a modest nominal visiting fee, which is waived off in case you decide to get the pest control done by us. Once you give us a confirmation, our team will visit again, as per your convenient day and time, and will work on the entire place, where they had seen the problems. Our team will then go about clearing the pests from your place. Once the work is completely done up to the satisfactory levels, we’ll then generate a final invoice with all the details of costs, such as the cost of materials, chemicals, labour, taxes etc. and hand it over to you; the payment is then collected. Why is Our Pest Control Service the best in Bahrain? Handyman provides the best pest control services in Bahrain. Our experts are not just experienced and licensed, but we also keep training them with newer materials, technologies and keep imparting new knowledge to them so that they stay at the top of their skills and are able to provide you with the best service in turn. Also, we use only the chemicals that have been prescribed as ‘safe for use’ by the health department. We never overuse any chemical and don’t use anything that might cause problems to our valued customers. 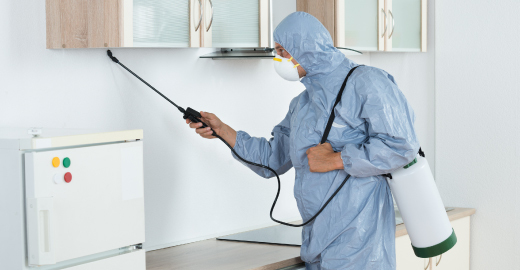 Our workmen will also guide you on the precautions that you need to take while the pest control in progress and post the work in order to prevent the problems from manifesting again. We promise of a satisfying and complete pest control solution. Our trust building nature and completely honest and professional workmen make us the best in Bahrain. There are many places in our homes, where we cannot reach and hence cannot be cleaned properly. It is those exact places, such as sink pipe, or a kitchen corner, or a sewage outflow from home, attic etc. These are the places where insects, rats, lizards, etc. choose to make their dwellings and hide. They lay their eggs, or babies, etc. there. and slowly spread to more prominent places in our house where we can sometimes see them. As they multiply more, the possibility of spreading diseases in the home also increases. If not controlled in time, they’ll take over the entire house, and cause problems like foul smells, droppings, dirty the place, not to forget diseases, etc. Pest control is necessary in order to prevent such problems from arising. At Handyman, we offer all kinds of pest control services all over Bahrain. We have a team of well-trained, experienced and licensed professionals who are more than just capable of treating the pest control. Our workmen can treat, remove & provide long lasting solutions to any pest problem at your place. Handyman is available to call on all days. We take bookings and appointments every day. You may book an appointment with our carpenters between 8AM-8PM on any day. You may call us to pay you a visit in advance or on an emergency. Our commitment towards our work makes our pest control services the best in Bahrain. Pest control is a time taking job and takes some time to have the job done completely. It dependson many factors such as the size of the place, type of pests, severity of the infestation, etc. Our experts will guide you through the complete process and will also let you know the time that will be needed to get the job done. What Does It Mean By Long Lasting? Again this depends on the type of pests that your house is infested with. More and more severe problems will require stronger treatments. Eventually that would tend to last longer than a mild treatment. Don’t hesitate to ask our experts about it. They’ll guide you accurately. Is it Needed From Time to Time? Although it is highly recommended to get pest control done at your place regularly, it is usually up to you. Getting pest control done from time to time will not only keep your house free from trouble making creatures but will also help you stay disease free.